piers supporting the walls and vault. The Rayonnant style of Gothic architecture emerged in France during the High Gothic period which lasted roughly between 1200 and 1280. It corresponds broadly speaking to the Decorated style of English Gothic architecture, though this emerged slightly later. In simple terms, Rayonnant architecture was less concerned with structural or engineering issues and more concerned with the decorative possibilities of two dimensional surfaces, such as the repetition of certain motifs at different levels and scales. From about the mid-14th century onwards, Rayonnant designs were gradually superceded by the Flamboyant style of Gothic architecture in France. What changed was the series of supports that compose the interior view; the vertical tension is brought to extremes, everything becomes more linear, without depth in the treatment of surfaces and visually without weight. Once again the Basilica of St Denis in northern Paris was among the avant-garde. In the 13th-century reconstruction of its choir, the new types of column - dense clusters of colonettes similar to a moulding or a rib - transformed the design of the nave into a purely graphic display. Builders also concentrated on the design of the stone frameworks that form and decorate the openings of the windows, making them gradually more elaborate, while on the exterior all forms of extreme gigantism were eliminated in favour of large but balanced proportions. The Rayonnant formula spread with surprising speed until around 1340, when it was interrupted by the recurrent outbreaks of the Black Death (134653) and the darker moments of the Hundred Years' War. The end of dynastic continuity with the ascent to the French throne of the house of Valois in 1328 greatly reduced the aura of sacredness surrounding the king and brought back much of the feudal favouritism, leading to a decrease in the creation of religious art and architecture and an increase in military and civil buildings, both royal and public. 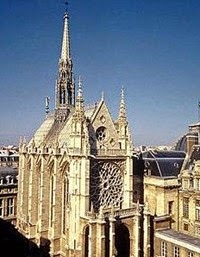 Paris was the leading centre for the elaboration of Rayonnant Gothic art, which reached its apogee at Sainte-Chapelle designed by Thomas de Cormont, Jean de Chelles or Robert de Luzarches, to hold the Holy Relics that Louis IX had acquired at Constantinople. The extraordinary airiness of the upper area is made possible by both the solidity of the external buttresses and the recourse to ingenious technical artifices. The refined quality of the architecture is matched by the rich decorations, the use of colour, and the marvellous polyphony of the sparkling, multicolour light that enters through the enormous stained-glass windows. Sainte-Chapelle carries the "skeletal structure" to extremes in terms of the technical possibilities of Gothic architecture: the walls disappear, replaced by a more or less continuous expanse of stained glass. Designed by Bernard de Soissons, the facade of Reims presents a row of narrow sculptural pediments above three deep-set portals. The depth and potential darkness of these openings is ingeniously offset by the use of stained glass art in the tympana of the portals in place of the usual sculpture. Reims presents a summary of all the earlier forms, but it is also new and original in the way it matches contrasting forms and uses them to create a unitary composition. Renowned as a mature expression of Rayonnant Gothic, the exterior of the cathedral repeats forms previously seen at Amiens, notably in the segmentation of the buttresses and the steep gables covered with decorative stonework (tracery), as well as Gothic sculpture of various forms. Indeed, the building is almost hidden from view by its forest of buttresses and spires. Inside, its high choir is considered to be one of the most outstanding Rayonnant structures of the Middle Ages. Overall, the cathedral has long been considered a masterpiece of German Gothic art, and is the city's most popular monument. Other important examples of Rayonnant Gothic include the west front of the Church of St Nicaise, Reims (begun 1231); the nave of the Abbey Church of St Denis (1230s); and the facade of the Church of St Urbain, Troyes (1262-86).  For more about medieval architectural design in France, see: Homepage.